How might we re-think the user experience of data visualizations to make complicated genomic information more accessible to non-experts? The nature of The Personal Genome Project as an open source online database of genome, health, and trait data raises important questions regarding a participant’s privacy and willingness to share their information publicly. This project was about understanding privacy risks, people's attitudes and behaviors related to privacy and security, and how web-based interaction techniques applied to consent forms could positively influence the amount of data they were willing to share. I led the team in a discussion of how people have unique attitudes and behaviors when it comes to maintaining their privacy and security. For example, some of us may be more private about our credit score and others keep their Instagram accounts accessible to all users. Some of us shred all bills and documents with our names and addresses on them while others close their blinds each night before going to bed. A person's preconceived attitudes and behaviors regarding their privacy and security add additional context to the exercise of re-imagining consent forms for sharing personal genomic data. By empathizing with our users and adding an additional layer of context to their mental state, my group was able to design a better experience for all contributors looking to participate in the public open source genomic databases. In order to better understand user’s attitudes and behaviors regarding privacy, I researched and implemented a privacy index developed by psychology Professor Tom Buchanan of the University of Westminster. I tested the scale among six individuals in order to measure its effectiveness and also to understand its capabilities in an online survey. The index's questionnaire will be implemented in future experimental designs about consent forms. My team and I also explored the risks and benefits of sharing personal genomic information among different circles of people. For example, the risks and benefits of sharing personal genomic information with family, friends, scientists, or on social media. In the future, the team will be testing whether making users aware of the risks and benefits of sharing will positively influence the amount of data they are willing to share via consent forms. I led the research on this project and contributed to the experimental design of the usability testing of improved consent forms on Amazon Mechanical Turk, and designed the poster for the Wellesley College Science Center Summer Research Program conference. 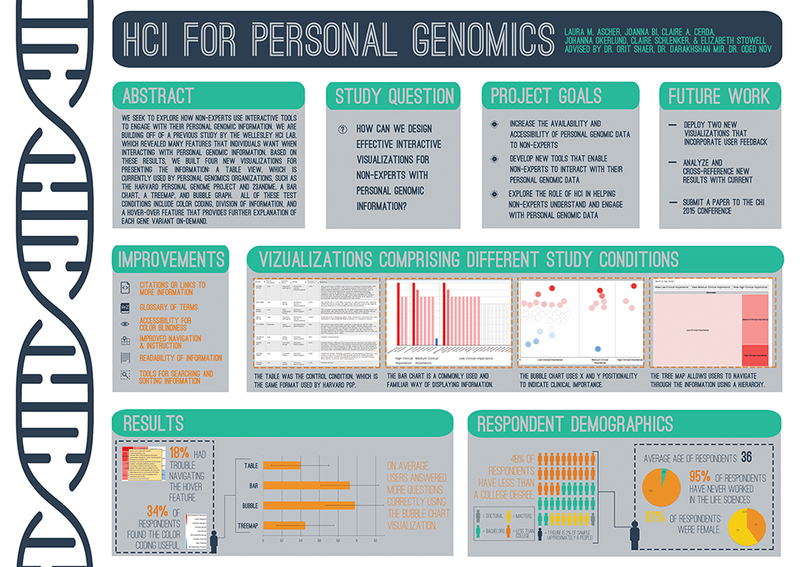 The Wellesley HCI team partnered with The Personal Genome Project from Harvard Medical School. The team also worked with Darakhshan Mir, the Norma Wilentz Hess Fellow in the Department of Computer Science at Wellesley College, and Oded Nov, a professor at New York University. Claire presenting her work with her Wellesley HCI Lab team at the Wellesley College Science Center Summer Research Program conference in Wellesley, MA. Our research was presented at the Wellesley College Science Center Summer Research Program conference. Future research will be submitted to relevant conferences.